Agriculture Extension Officer, Junior Assistant, Senior Assistant, Live Stock Supervisor, Anganwadi Supervisor, Junior Accounts Officer Jobs. 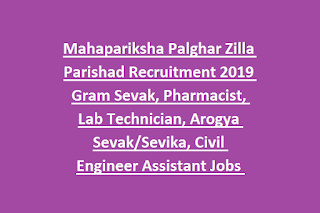 Mahapariksha online form for this Palghar ZP recruitment is available from 26-03-2019 to 16-04-2019. Official website for this Palghar ZP Recruitment is www.mahapariksha.gov.in. Exam pattern and Syllabus, age limits, selection process and other details about this Palghar Zilla Parishad Arogya Sevika, Gram Sevak, Pharmacist and other posts are updated below. There are total 708 posts in this Palghar Zilla Parishad rural development department recruitment 2019. Refer notification for post wise qualifications. For General Candidates 18-38 years, for reserved candidate's age limits are 18-43 years. Candidates will be selected on basis of merit in written exam only. Written Exam will be conducted for 200 Marks. Total 100 questions will be given. For Anganwadi Supervisor, Senior Assistant, Junior Assistant and Extension Officer posts exam will be conducted in 4 general sections. For all other posts exam will be conducted in 4 general sections and technical section. 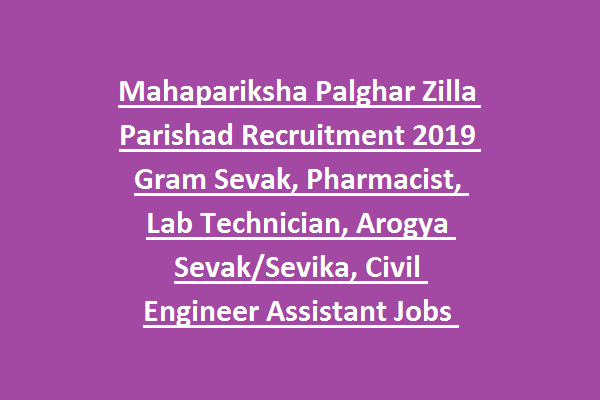 Apply online for this Palghar ZP recruitment for the available vacancies of Rural Development through official website of www.mahapariksha.gov.in/. Last date to apply online is 16-04-2019. Admit Card or Hall Ticket for Palghar ZP recruitment is available in Mahapariksha website before 10 days from the exam date.